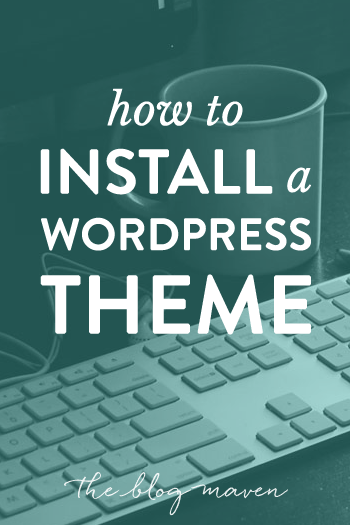 Whether you’re starting a blog or you’ve just never done this before, installing a WordPress theme is incredibly easy. In this quick tutorial video, I’ll take you step by step through installing your theme (if you haven’t already chosen one, you’ll want to check out my recommendations of the best WordPress themes for bloggers). I’ll be using the Genesis Framework as an example, which is a two-part process: first you install the framework, then you install a child theme. If you’re using a regular theme, you’ll only have one file to install. Log in to your WordPress dashboard and let’s get started! Download the files for your WordPress theme to your desktop. You’ll be uploading the whole Zip file, so don’t unzip it! On your WordPress dashboard, navigate to Appearance > Themes. At the top, click Add New. Again at the top, click Upload Theme. Select the file you want to upload. If you’re using the Genesis Framework, you’ll upload the framework first. Click Activate to activate your theme. If you’re using Genesis or another framework, repeat steps #2-7, this time uploading your child theme. That’s it! Easy as pie. If you run into any issues uploading your theme, let me know in the comments section below. I want this to be as painless as possible so you can just start blogging! …and once you’ve made it all the way through, check out my favorite Blogging Resources. It’s really cool. I’m new with WordPress and you show here how to install a WordPress Theme easily and quickly. Thanks for the awesome sharing. I just purchased the foodie theme with the framework after watching your video, so excited. However, when I go to my wordpress account to upload my new theme there is no button that says “Add New” on my appearance page. Uh oh- what does this mean since I already purchased the framework and theme? Hmm…are you using the free wordpress.com, or are you self-hosted? You have to be self-hosted (meaning, using a hosting company) to upload your own themes. On my dashboard, at the very top of the page under Appearance > Themes, it says “Themes” and then “Add New” out to the right of it. can you customize the header on all the Genesis themes or does it have to specifically say? how about the foodie theme? p.s. great blog, very informative! Yes, you can customize the headers on all Genesis themes. You can either type in a new name using the same font that the kit comes with, or you can use an image header (like a logo). On the Foodie theme, the designer has tutorials on her site that take you through each step of the process. You get that info inside the download area once you’ve made the purchase. Hope that helps!